Taylor Park has been a staple of the Fond du Lac community since it was acquired by the city in 1893. Since then countless memories have been made there and the Friends of Taylor Park & Pool aim to keep it thriving for years to come. Their organization wanted a modern website to help spread awareness about the work they were doing, while also helping spread news about the park & pool and the upcoming events hosted at the park. So we built the site to be as clean and easy to navigate as possible while still providing all of the information they know people are looking for. The site is fully mobile responsive so you can get the information you want regardless of the device you are on. With the click of a button you can be taken directly to the pool hours and pricing, or dig in and learn more about their organization. A global sidebar shows the current weather at the pool, the next few upcoming events, and the most recent news posts on the site. As you go further into the site you will see a full calendar with all of the events coming that month, and a full blog where you can see all the past and future news. 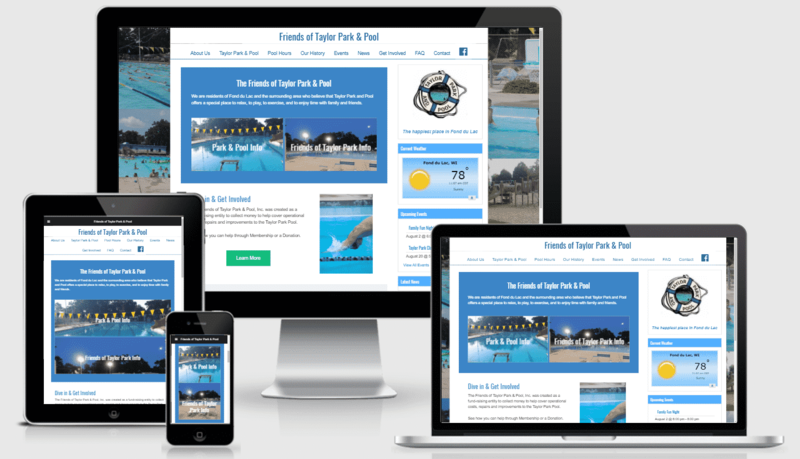 Diving into the site will bring you to a history of Taylor Park & Pool complete with the story behind the forming of the Taylor Park University and a gallery of images of the park from throughout the years. It also contains forms connected to PayPal so users on the site can easily donate or become a member of the Friends of Taylor Park and Pool. Taylor Park & Pool is full of history and we were honored to be a part of preserving the park for future generations. We hope they love the site and it helps them and the park flourish for years to come.